A new pot of money brings discretionary economic incentives to the Golden State. Let’s make sure San Diego gets a piece of the pie. Pictured above: Gov. 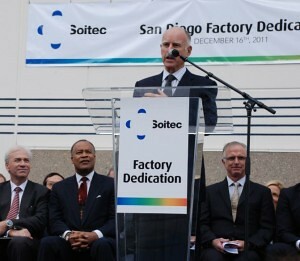 Brown speaking at the dedication of the Soitec factory. Soitec is a french semiconductor manufacturer that chose to open its North American headquarters in San Diego, creating approximately 450 jobs throughout the region. Every day we hear from companies both in San Diego, and those looking to move into the region, that are impressed with all the county has to offer businesses. We have top-tier universities that churn out one of the most qualified talent pools in the country. From Oceanside to Otay Mesa, we have a diversity of commercial space that suits virtually every industry. And of course, we have near-perfect weather that helps create a work – lifestyle balance that is second to none. But for all the things we have, there is one thing we don’t: discretionary economic incentives. All of that is about to change. Last year, Governor Brown introduced the Governor’s Economic Development Initiative (GEDI), which is designed to give California the edge it needs to continue to attract, retain and expand businesses. GEDI has three main components: a Statewide Sales & Use Exemption for Manufacturing Equipment, which helps companies obtain qualified manufacturing equipment without having to pay the state portion of the sales tax; a New Employment Credit, which helps employers in designated regions around the state hire employees that meet certain criteria; and the California Competes Tax Credit, a discretionary corporate income tax credit available to businesses that want to come to, or stay and grow in California. GEDI went into effect on January 1, 2014. San Diego can naturally lead the pack in the first two areas. The new employment credit is applicable to the hiring of recently separated veterans, of which the region has in abundance. Due to a strong biotech cluster, the region also has a plethora of high-tech manufacturers that can benefit from the equipment credit. But it’s the California Competes section that really peaks our interest. Until now, states such as Texas have commanded headlines with grandiose economic incentives, while the perception is that California has no incentives to offer businesses. In reality, we know that more than 70 percent of a company’s productivity - and often its decision to operate in a region - depends on talent availability, but it’s frequently these economic incentives that give a competitive edge to regions looking to attract new investment. Yes, to many San Diego sells itself. But it’s a competitive market globally, and we can’t rest on our laurels any longer, hoping people will come to California because this is where innovation happens. Starting Jan. 1, California Competes created a $30 million fund for companies that want to come to, or stay and grow in California. Interested employers can apply for these tax credits through the Governor’s Office of Business & Economic Development (GO-Biz), which will negotiate the credit before it is sent to the newly created California Competes Tax Credit Committee for approval. The fund will increase to $150 million in July of this year and $200 million in July 2015. GO-Biz has gone to great lengths to make sure that California remains competitive to businesses of all sizes, by marking 25 percent of the credit for small businesses (less than $2 million in profit). When it comes to GEDI, EDC’s goal is to make sure that companies throughout San Diego County are aware that there are incentives available, and to ensure that as a region, we are taking advantage of them to attract new companies, and to support and grow those already here. California Competes is a competitive process, and we want to make sure San Diego gets its fair share of the benefit. Here’s where EDC comes in: we realize that like many government processes, this one may be a bit complicated, and we’re here to help you navigate it. Contact us at info@sandiegobusiness.org to get started and help us by spreading the word about these valuable credits. The next big idea- and employer- is out there somewhere. It is likely here already. If we add these economic incentives to the existing list of reasons to operate in the region, before long, even more innovators and innovative companies will be able to call San Diego home.